In J. Jeff Kober’s The Wonderful World of Customer Service at Disney he states in his preface, “To all who read this, may you find not only ideas, but also hope and inspiration in adapting the lessons and experiences of Disney to create magic in your own organization.” That may seem like a tall order, but Kober is up to the task. If his name sounds familiar, it is probably because you have been reading his articles on MousePlanet for the past several years. Throughout his fist book, Kober leaves no stone unturned, from animation to park warning signs, while examine what has made the success of Disney something to admire and aspire to. Yet, in doing so, he isn’t simply touting the wonders of Disney, he is also discussing real-world scenarios where similar problem solving skills could be used. Similarly, while The Wonderful World of Customer Service at Disney covers overarching topics like philosophies and standards, it also breaks down everything from leadership, responses to customers, and the feelings of guests/clients/customers to the waiting game, guest compliance, and creating memorable (in a good way) experiences. 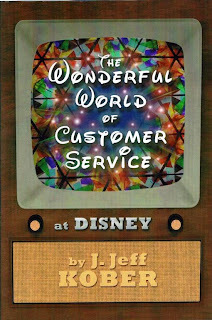 For anyone who is thinking about starting their own business, has their own business, or is looking for a way to jumpstart their, and their employees, sluggish outlook on business, I highly recommend J. Jeff Kober’s The Wonderful World of Customer Service at Disney. For the rest of you, I also recommend this book, you’ll learn something about the way in which Disney looks at and interacts with their guests. And who knows, you might just find something to spark more positive interactions in your own life.